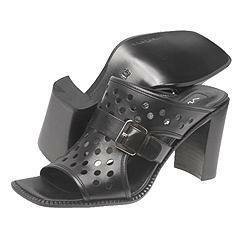 Discussion in 'Shoes, Shoes, Shoes' started by leyla m., Apr 25, 2003.
how could someone design these shoes for LADIES???? and what are these good for??? AHHHHHH!!!!!!!!!!!!!!!!! SCARY!!!!!!!!!!!!!!!!!!!!!!!!!! Protect me someone please!!! I think it's the black leather that makes the first shoes look bad...it's like an old-lady comfort walker shoe. I like the Clarks Wallaby style, though, in brown suede...although I think's it really a shoe that suits boys. I really dount see the problem with the first one. But teh second one is very strange (wwwaaaah).!!! These are Dino shoes for kids to play hide-and-seek in the garden. I love Dior shoes, but these are horrible! trean, do you remember the Buffallo trend??? ?